Patrick Stewart as Jean-Luc Picard. 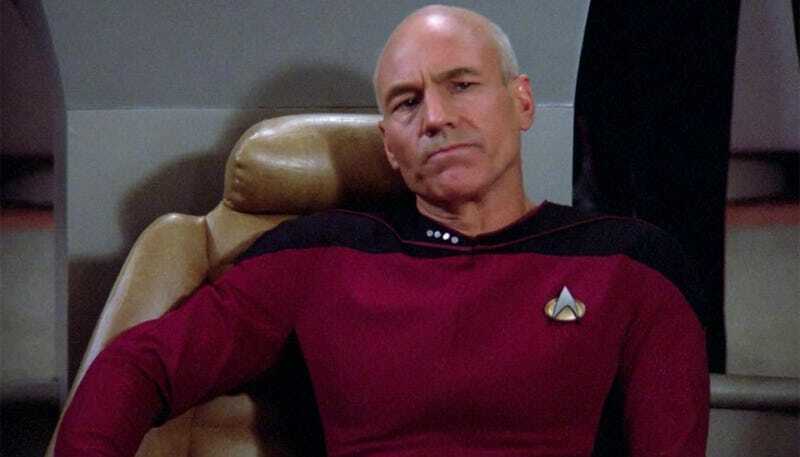 Executive producer Michael Chabon is helping bring back one of Star Trek’s greatest captains, with a new show centered around Captain Jean-Luc Picard (played once again by Patrick Stewart). Chabon and his other writers have a lot to live up to—not just with honoring Picard’s legacy, but also the decades of Star Trek canon that have shaped several shows and films. Based on a recent interview, his approach is pretty healthy: Follow the canon where you can, but find places to make it your own. In an internet with CNET, Chabon was asked about his new Picard show while discussing his work on the Star Trek: Short Treks episode “Calypso.” He explained how he wants his version of Star Trek to uphold Gene Roddenberry’s utopian vision of science fiction, the idea that humanity can overcome its darker drives and move forward into a brighter, more promising future. Given the current political climate, Chabon thinks it’s time to give humanity hope... and Picard might be that hope we’re looking for. I think we have this responsibility to continue to articulate a hopeful, positive vision of the future. I think if anything that’s more important now than it was when The Original Series came out... A positive vision of the future articulated through principles of tolerance and egalitarianism and optimism and the quest for scientific knowledge, to me that’s feels fresh nowadays. Of course, when it comes to honoring Roddenberry’s vision, it’s not just about following the themes, it’s also about following the canon. And that can be tricky—it’s something Star Trek: Discovery has struggled with since its inception. The Picard series will take place further in the future than any existing Star Trek series, giving the writers far more flexibility than, for instance, Discovery. All the same, Chabon says he feels a responsibility to stay true to the canon. But he also feels there are places where he can grow, expand, or even challenge the canon in a way that reflects the story he’s trying to tell. Any Star Trek writer, any writing room on any Star Trek show after, let’s say, The Original Series had a responsibility to consider canon, to know your canon... At the same time, and this is true when you’re dealing with any kind of canon, there’s always gaps. There are cracks. There are contradictions. There are mysteries that we never got to hear the explanation of, when people allude to things in canon and don’t give any further explanation. I think it’s important not just to view canon as a barrier, as a perimeter beyond which you can’t go, a kind of a grid that you’re trapped on. You try to find the loopholes. You find the empty areas. You find the things the canon doesn’t seem to have anything to say, and you say it. And if you’re really lucky and you get to be working on a Star Trek show, then what you say becomes canon itself. I definitely recommend checking out the whole interview on CNET, especially if you’re looking for more details about “Calypso,” a fascinating (and far-future!) addition to the Star Trek universe. In the meantime, we’ll keep sitting on our heels and waiting for CBS All Access’s Picard show, which already sounds like it’s going to be something special.